Do CBD parking prices in your city look expensive when compared with alternative uses of that space? If a parking deck in a city-centre building were not parking, what else could it be? There are various possibilities. A basement parking lot could have housed retail or a food court for example. Ground level parking might otherwise be retail. Parking decks above ground level could otherwise be office space. This Bangkok building (in Siam Square) has many storeys of parking which could have been office space of course. Is it useful to ask how much income the parking levels yield, compared with the office levels? So does parking provide returns on investment that are comparable to those alternative uses? It is not easy to answer that question but insights emerge from comparing city centre parking prices with city-centre office rents. To do that we have to express both as a price per month per square metre. This is possible with the help of data on both from Colliers International. The underlying idea here is the opportunity cost of structured parking in central business districts (CBDs). In other words, we get an idea of the cost of the built space that is used as parking by thinking about the cost of similar space that is used for something else. Is $400 per month for season parking outrageous or reasonable? Well, it depends ... But what does it depend on? One suggestion: the price of a hamburger! This rule-of-thumb for hourly parking prices comes from Pete Goldin at the Parking World blog, citing Dr Adhiraj Joglekar, founder of the website driving-india.blogspot.com. Hmmm. I guess they are alluding, tongue-in-cheek, to the Big Mac Index from the Economist. This index uses burger prices to correct for differences in the purchasing power of money in different countries. 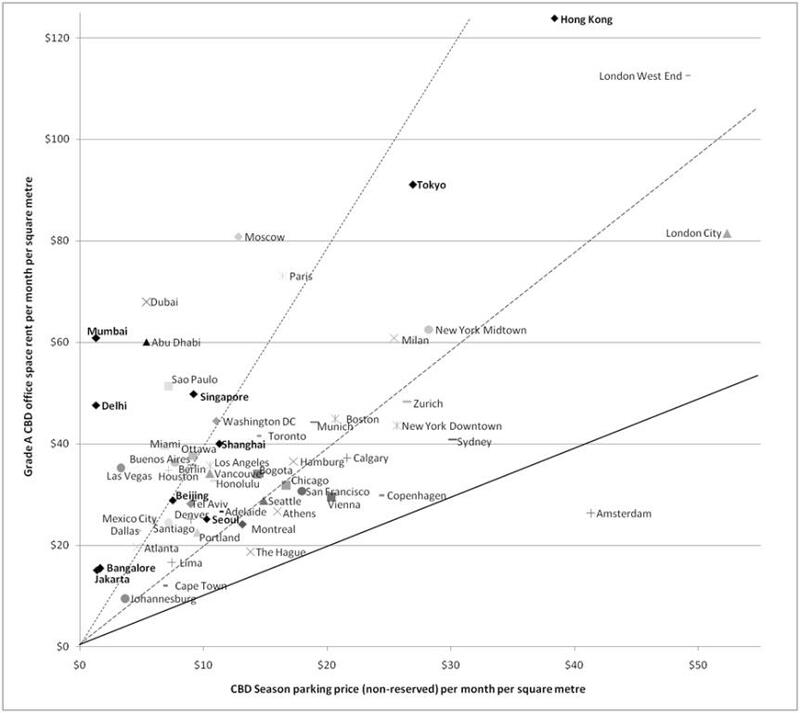 So, as part of the Asian cities parking study, I compared city-centre parking prices with city-centre office rents. This was helped by nice data from Colliers International on both CBD parking prices and Grade-A office rents for many cities around the world. The graph below is the result, using their 2009 data. The contrasts are really striking. Possible inaccuracies in the data and volatility in the prices cannot possibly explain such huge differences. 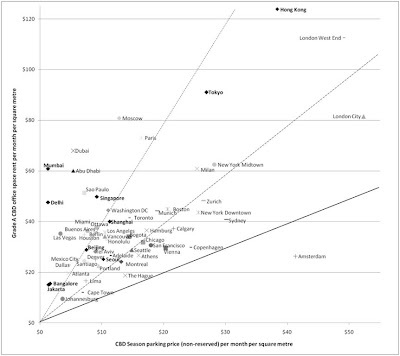 We have cities near the diagonal line where CBD parking rents per square metre are comparable with Grade A office rents. It is the solid line - sorry it does not look diagonal. Amsterdam and Copenhagen are prominent along with London City, Vienna, The Hague and Sydney. At the other extreme, Delhi and Mumbai in the upper left part of the graph have expensive office space but extremely cheap parking. Parking prices clearly do NOT yet take account of land prices in Indian cities. Jakarta and Bangalore at the bottom left have quite cheap office space and even cheaper parking. In Jakarta's case this might have something to do with the price controls imposed by the city government. I was a little surprised by Singapore's rather cheap CBD parking relative to its CBD office rentals. This is likely to change as parking supply is now growing more slowly than other built space since 2003 when Singapore CBD parking requirements were lowered drastically. In the graph both CBD parking prices and CBD Grade A office rents are shown on a rent per square metre basis. 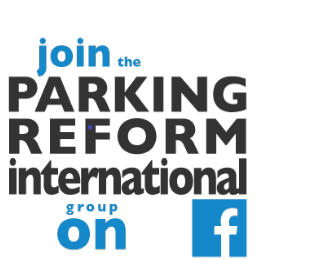 To convert parking prices per space per month to parking prices per square metre per month I used 19.5 sq. m. as a very rough estimate of the space required for a parking space, including aisles, etc. So $10 per sq.m. per month is about $195 per parking space per month. I believe the parking data is for parking in structures, not open lots. But what this doesn't factor in how the value of office space might also be tied to the ability to park nearby. At least insofar as chief execs might be unwilling to take public transit, etc. I would look directly at excess demand to get a sense whether prices are too low or high. How hard is it to find a parking space? Prices should be such as to keep most parking places occupied most of the time, but keep some vacancies, reflecting turnover. Peak load pricing probably makes sense (and perhaps no price is low enough, at some hours, to keep places occupied). There are too many other variables, such as packaging office space with on-site parking, to make your comparison indicative of much. Various parking options might be mandated by law and would affect the price of office space, rather than parking space directly. To evaluate the price of parking, look at excess demand for parking. pricing parking space based on the opportunity costs of the land they use is reasonably efficient. however, the bigger picture is that parking is one critical part of the commuting cycle in a motorist. from home, to walking to car, driving on roads, paying road tolls, trudging through congested roads, cruising for parking spaces and eventually parking...parking is one key component of the travel costs and its pricing should take into account the marginal external cost caused to other public commuters from the driving. pricing it well can potentially achieve wider objectives in terms of reduced congestion.